As you must know by now, we always advocate for natural light in food photography. Its unique qualities enhance the colors and shapes of the food, and the combination of natural light with food just feels and looks right. But sometimes daylight is not reliable or available for a shoot and you have to switch to artificial lights. Maybe you have experimented with a table lamp or turned on extra lights in your kitchen, and if not, we encourage you to give your lights a try and study the resulting photos. Most likely you'll find that you want more control over quantity, quality, and direction of the light. Now you must pick your light source. While your a common choice may be to use fluorescent lights, we recommend using speedlights for more power, control, and portability. (Officially only Canon calls its line of hot shoe flashes speedlights, but it has become the catch-all term for small off-camera flashes.) Since most food photography takes place on a small tabletop scene the power of these little flashes is all you need. 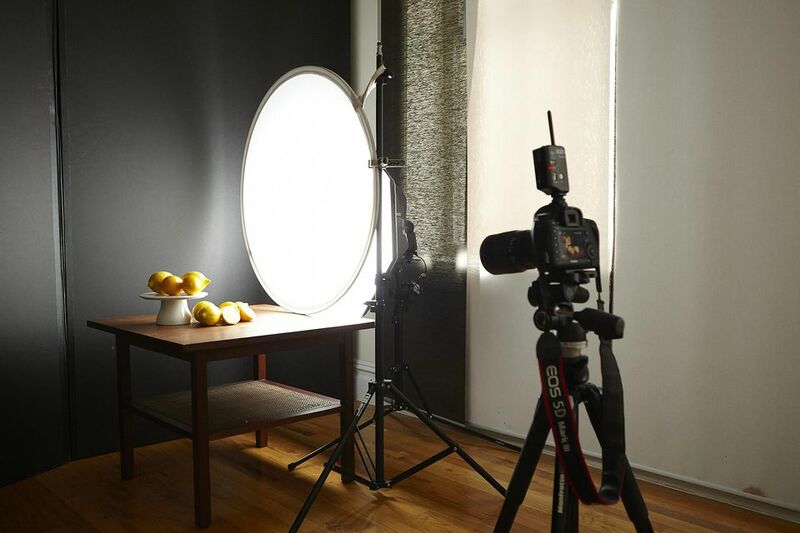 Of course, you could also turn to the big guns, strobes by Profotos, Broncolor, or Elinchrome, to name a few, but for a beginning food photographer small speedlights are probably the best place to start. First thing, if you are trying to replicate natural light, do not put your flash on your camera's hot shoe! Instead, mount it on a light stand to the side of your setup. When you take a test shot you will see that the flash creates a very strong and harsh light. You can use an umbrella, bounce it off the wall use a softbox to diffuse the light. If the light is still too harsh place a diffusion screen in front of the softbox for double diffusion. Which Flash Should I Get? Your next question is probably which flash you should use. Since each camera brand has different requirements we recommend you ask your local camera store for advice on which speed light is right for you. A good way to go is using the brand you already have. For example, if you have a lot of Canon gear, then go with Canon Speedlights. While they are not cheap they are precise, durable, and will smoothly integrate with the rest of your Canon system. While it's not necessary, it's helpful to stick to the top of the line when it comes to your equipment. Daylight, Cloudy, Tungsten, Fluorescent, Flash, or Manual?